Monash South Africa is dynamic institution that makes a positive difference by engaging in high quality, global competitive research and education in order to improve the lives of others. It is located in Ruimsig, which is 25 km north-west of central Johannesburg. It is a 100 hectare campus, which contains modern and state of the art technologies. 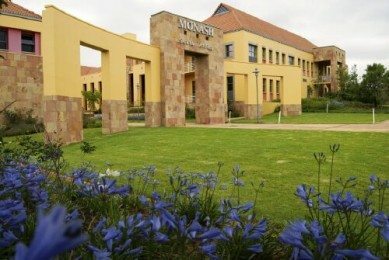 Monash South Africa is wholly owned by Monash University Australia, but is registered with the South African Department of Education as a private higher education provider, and an incorporated, not-for-gain association. Monash University is represented on the board of the South African Higher Education Community Engagement Forum (SAHECEF). They have hosted one of SAHECEF’s national meetings, as well as coordinated the governance and management working group. At Monash South Africa, community Engagement takes the form of service-learning, internships, practicums, community-based research and volunteerism. The Community Engagement Department facilitates and supports Monash staff and students to partner with various stakeholders in the region to meet its diverse social, economic and education needs. Monash believes in learning and education as key tools in helping to engagement with our community and its members. It embraces active, committed, co-operative, creative, innovative and mutually beneficial interaction that advance good will with individuals, groups and entities outside of the university and in all sectors of society. Its staff and students are committed to making a positive difference by applying their skills and knowledge on the campus community, within the province, in South Africa on the African continent and in the world as a whole. An underlying message of the Community Engagement Department is that if the role and benefits of a university education are valued only for their economic contribution to the individual and society we are the poorer for it. The Monash South Africa experience, although still in its infancy, demonstrates that community engagement is indeed a worthy aspiration for higher education. It puts the humanity back into education and research successfully enriching the lives of the students who pass through our university corridors. Led by Bronwyn Du Rand, the Community Engagement Support Team started a new community leadership and collaboration strategy: the Monash Saturday School. The school has had many highlights and the new Ulwazi tutoring program has been very successful. The opening of the Monash Krishna Khetia library proved to be one of the challenging and rewarding projects that we have undertaken. 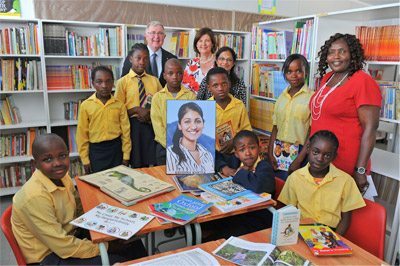 The Krishna Khetia Library strengthens are partnerships with the schools and the local community, allowing us to have a greater impact on education in the surrounding areas. There are other community-focused programs at Monash South Africa. The Monash Oxfam in South Africa Student Placement Program gives students interning opportunities in local community organizations. The “Enke: Make Your Mark” initiative aims to reduce inequality in South Africa. The Christmas in November event gathers present for orphaned and vulnerable children. In all, volunteering is an important part of student life at Monash South Africa. Volunteering began organically as a movement by the students themselves. It is about partnering with, and strengthening ties to, the community in a meaningful way. Students who choose to volunteer gain valuable, career-enhancing skills, build confidence and develop friendships and networks which may prove useful when the time comes to look for a job.